Rising Pune Supergiants’ finally snapped their losing streak after they defeated Sunrisers Hyderabad yesterday in their home ground. The star of the night was an unexpected man – Ashok Dinda. 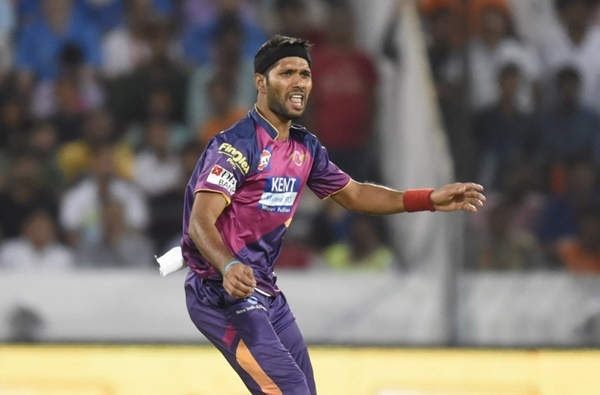 Dinda, who was brought in as replacement of left-arm spinner Ankit Sharma, picked up match-defining figures of 3/23 to rattle the SRH side for just 118/8. The Bengal fast bowler expressed relief after the team’s win via the Duckworth/Lewis method against Sunrisers Hyderabad, finally bringing to an end a run of four defeats in IPL. “It’s very nice to win the match. It was important. We played well, batting and bowling and fielding also,” he said at the post-match press conference late last night after RPS won by 34 runs in the rain-hit match. Replying to a query, Dinda, who was Man of the Match, said the rain did not help the team in anyway. “No, sometimes it’s disturbing. Because we are going and coming back again. For batsmen, it is very tough,” he said. Dinda was happy to have got the crucial wicket of SRH captain and batting mainstay David Warner. “A plan was there for Warner… Just hit the perfect area and bowl incoming deliveries to David Warner. For me, it was out swing, for him it was in swing. That was the plan, just wicket to wicket bowling,” he said.